We’ve got a new 109 terabit-per-second broadband speed to aspire to--and secretly envy. The new record holder is the National Institute of Information and Communications Technology in Tokyo. This record-setting broadband speed was not produced through any regular old fiber-optic cable, though. A typical fiber-optic cable pulls off its faster data transfer speeds by separating one light to carry multiple snippets of data across the same cable that end up being received as one pulse. 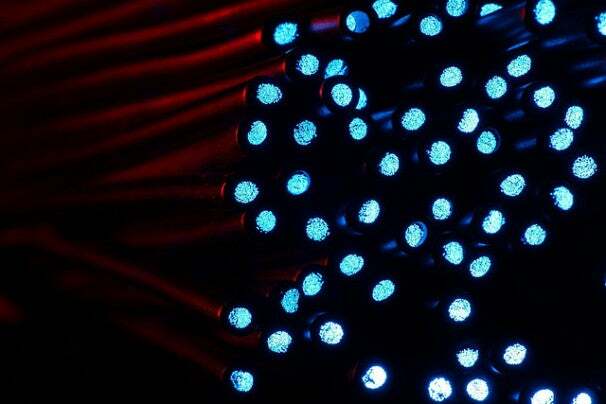 The Japanese institute simply added 7 more of these data-guiding cables, each carrying 15.6 terabits per second to bring a total of 109 terabits per second. This isn't the first time researchers have managed such ridiculously high data transfer rates. Just last month, researchers at the Optical Fiber Communications Conference in Los Angeles achieved a 101.7 terabit-per-second data transfer rate by splitting the fiber light into 370 separate lasers. Meanwhile, the rest of us are sad-faced and wondering what’s the point of clamoring over a measly 1Gbps fiber network.